In a candidate for 2003's upset of the year, Ricardo Mayorga knocked out Vernon Forrest. The brash 29-year-old was on top of the world. Who actually thought after all the ups and downs and layoffs that he’d still be here eight years later? Let’s not kid ourselves. Ricardo doesn’t deserve a title shot. He’s had one fight in over two-and-a-half years, and although I usually hate to see “name” fighters get the title shots, there are few who would match up well against Cotto at 154. And those who do probably won’t be able to attract the casual boxing fan the way Mayorga can. Mayorga is crazy in every sense of the word, but he brings the style that makes a good fight. With that and his character, he’s marketable before the fight, and during the fight. He’ll talk a big game, but he’ll come to fight. He comes in swinging wildly with everything that he has and even though he has taken a beating in the past, he is still pretty durable. He took a beating from Trinidad before he went down three times in that pivotal eighth round, and it was the quickness of De La Hoya that really troubled him in their encounter five years ago. Also, in one of his better performances, he lasted up until the last second (literally) against Sugar Shane Mosley. The difference between those marquee losses and this fight with Cotto is that Mayorga is the naturally bigger man. He fought Trinidad at 160, and Trinidad had been at that weight for a while. Cotto has just recently moved up to 154, and it was only a few years ago that Miguel was at 140. However what Miguel has that will hurt Ricardo every time is body shots. The boxer-puncher Cotto was a few years ago terrorized guys with that left hook to the body. And even though there is only a one fight sample of it, Manny Steward was able to make Cotto use a lot of jabs and body shots against Yuri Foreman last June. Trinidad broke Mayorga down with body shots, and the smoking and drinking that Mayorga has done since he was a child doesn’t help his conditioning and his ability to withstand body shots. Mayorga, for his part, does seem to be taking this fight seriously and already appears in great condition. That being said, Ricardo is now 37 and every advantage other than size goes to Cotto. You have to believe that under Steward, Miguel will utilize his boxing a little more, especially against a come-forward fighter like Mayorga. While Miguel does have a sturdy chin and great heart, he has been dropped and hurt on a few occasions. 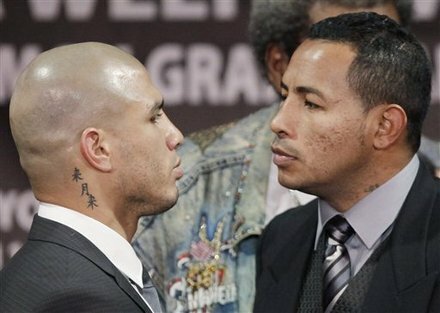 Should one of Mayorga’s wild bombs land, Cotto may find himself in trouble. Other then that, it’s hard to see any other way Mayorga can win this. Expect Cotto to break Mayorga down with boxing and hard body shots, to earn the TKO around the sixth round. Who wants a piece of Sergio Martinez?